Living in the moment, as work and family life require, often means that we do not have the chance to lift our heads up from immediate detail to consider the long-run, big picture. In spite of warnings of burst bubbles and meltdowns, the big picture we see for the Canadian housing and mortgage market is a healthy one: housing and mortgage markets will follow a favourable path, and, while there will be some hills and valleys along the way -- accompanied by speed bumps and potholes -- the direction of the path is one of growth. Although real estate markets are primarily local, shaped by the demographics and landscape of a particular region, national factors, such as interest rates, bank regulations, lending policies, and CMHC insurance, also play a significant role. Given the attention that these national factors are currently receiving, and the fact that demographic trends fundamental to all regions and markets can be illustrated nationally, this brief analysis focuses on the national context for Canada’s housing market and, by extension, the mortgage market in the coming years. The population of Canada is projected to grow from 34.8 million residents in 2012 to 38.4 million in 2022, an increase of 360,000 people annually (equivalent to adding another Oshawa or Metro Victoria each year). This one-percent-per-year growth will add 3.6 million people to the country over the next decade, the equivalent of adding another Metro Montreal or another Alberta during this time. That said, while population growth will provide fundamental support to residential markets (both mortgage and housing), demographic change will determine its characteristics. Appropriately, much is made of the impact of Canada’s post-World War II baby boomers on residential markets; this group, born between 1946 and 1965 and aged 46 to 65 in 2011, account for 28 percent of the Canadian population, our largest 20-year cohort. Having acknowledged the scale of the boom generation, it is also important not to overstate it. There are two reasons for this. First, while the baby boom is the largest generation in Canada, contrary to popular perception, the one directly following it (those born between 1966 and 1985) account for almost as large a share: 27 percent. Thus, those concerned with there not being a sufficient number of people in the age groups immediately younger than the boomers to replace them as they age can rest easy in this regard. The second, and most significant with respect to housing, is that the boomers will be with us, and in private housing, for a long time to come. The largest group of boomers is currently between the ages of 50 and 54 and, at today’s life expectancies, will still be alive (and in housing) thirty-five years from now. Thus, the impact of the aging of the baby boom generation will be on the character of housing demanded, not on the general level of demand. The aging of Canada’s current residents, combined with additions and losses through births, deaths, and migration, will change the size and age composition of the country’s population. In particular, rapid and significant growth will characterize the older age groups as few people are there currently, with relative stability driven by immigration coming to the younger ones over the coming decade. 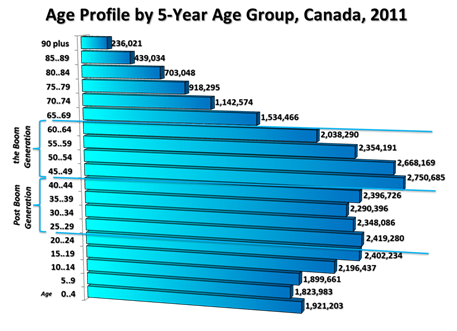 For example, the 55 to 64 age group would be the largest older age group, accounting for 5.30 million residents in 2022 (14 percent of Canada’s population), up from 4.49 million in 2012 (when it accounted for 13 percent of the population); that said, the folks in this age group would no longer account for the dominant share that they did when they were 45 to 54 years old. 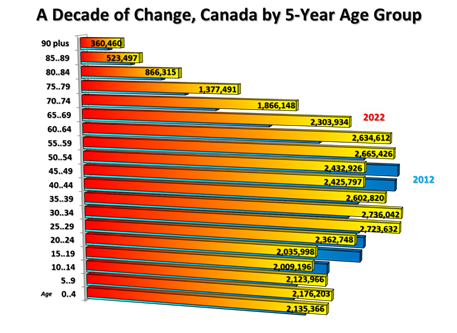 A decade from now, the largest ten-year age group would be those aged 30 to 39 (5.46 million people, 14 percent of Canada’s population), achieving its dominance as a result of the aging of today’s 20 to 29 year olds, combined with net immigration to Canada within this cohort. The fastest-growing age groups would be those aged 55 and older, which are projected to grow by 2.93 million people (a 30 percent increase). This shift is largely explained by the aging of today’s 45 to 54 age group, the peak baby boom cohort, into the 55 to 64 age group over the next ten years. In part driven by the boomers aging out of it, the under-55 age group will experience only modest net growth, adding 620,000 people (a two percent increase) over the same period. While the number of people under the age of 15 and between 30 and 44 would grow, the population aged 45 to 54 would actually decline, falling by more than half a million residents, while those aged 15 to 29 would decline by 576,000 people. Contrary to some expectations, this pattern of aging actually bodes well for Canada’s housing market: the most rapidly growing age groups over the next decade will be those in which people have the greatest propensity to be the maintainer of a private household. The propensity of people to maintain a household is strongly correlated with age (for every household there is one person identified being primarily responsible for its economic well-being, referred to as the household maintainer). This life cycle pattern shows that the highest propensities to maintain a household occur in the 75 to 79 age group, where 65 percent of people in Canada were household maintainers in 2006 (the most recent year for which these Census data are available).The adjacent 80 to 84 age group had a similar, 64 percent maintainer rate in 2006, and those aged 70 to 74 had a 62 percent maintainer rate. These high rates contrast with the youngest in the population, where only two percent of those aged 15 to 19 are maintainers, as they typically live with their parents or someone else who is responsible for the household. The life cycle pattern of household maintenance is very stable, showing little change over the 1996 to 2006 period, ranging narrowly between 47.2 and 47.5 percent of Canadians aged 15-plus being household maintainers. Even in looking back to the 1971 Census—before the boomers started to enter the housing market en masse—40 percent of Canadians were household maintainers. This shows that the population’s collective preferences about how they choose to live represent a significant determinant of market conditions and have not changed dramatically over the past four decades. Having said this, there are some changes for specific age groups that are worth noting, primarily in the younger and older cohorts. Between 1996 and 2006, maintainer rates for the 65 to 69, 70 to 74, and 75 to 79 age groups dropped slightly, the result of life expectancies for males growing slightly more rapidly than for their female counterparts, which, in turn resulted in a narrowing of the historical male-female life expectancy gap. The net result of this was a growing share of people living as couples in these age groups, thereby nudging maintainer rates downwards. Within the 85-plus age group, however, increasing rates were the result of the inevitability of females still living longer than their male counterparts. This was also the result of improved health and increased mobility within Canada’s elderly population, which has permitted people to remain in their own homes later in life. Of note is that these increases in maintainer rates for the older cohorts were accompanied by relative reductions in occupancy rates for institutional and collective types of seniors housing. For the younger cohorts, rates generally fell over this period, driven in large part by further increases in the share of kids living in the familial home. By 2006 41 percent of kids ages 20 to 29 were living in the familial home, up from 36 percent a decade earlier and 25 percent in 1981. Interestingly, the 2011 Census reported that 42 percent of kids aged 20 to 29 were still living in their parents’ home, only slightly above the share reported in 2006. This life cycle pattern will generally prevail over the course of the projection period, with rates for the under-30 population becoming slightly lower over the next decade, along with those for the 65 to 79 age groups. Continued increases in life expectancies would see rates for the 85-plus group slightly higher than in 2006. The combination of significant growth in the 55-plus age groups and the life cycle pattern of maintaining a household would result in housing occupancy demand in Canada growing by 13 percent over the next decade. In other words, an additional 1.8 million dwelling units would be required to accommodate Canada’s growing and changing population by 2022. The reason that the percentage increase in housing occupancy demand exceeds that of population (13 percent versus ten) is that the age groups that are projected to see the most rapid growth (the 55 to 79 population) are also those that exhibit the highest household maintainer rates. The effect of demographic change and Canada’s aging population will be even more significant for the home ownership market than for the market as a whole. The impact will be twofold, in part driven by the highest rates of home ownership being in the rapidly growing 55-plus age groups, and in part by the propensity of people of all ages to be home owners. The most recent Census data show that owner-occupier household maintainer rates increased to 32.5 percent in 2006, up from 31.3 percent in 2001 and 30.1 percent in 1996. Over this ten-year period owner-occupier rates grew by eight percent. In terms of their life cycle pattern, ownership rates pass 45 percent in the 55 to 69 age group and continue to increase to reach a peak of 47 percent in the 75 to 79 age group. The lower rates in the 80 to 84 and 85-plus age groups (43.1 and 31.5 percent) reflect increasing propensities to occupy both rental housing and institutional types of accommodation in these older age groups. In most age groups the propensity to maintain owner-occupier households increased from 1996 to 2006, the exceptions being the 60 to 74 age groups where they remained constant. While the increases were modest in the under-60 age groups, more substantial changes were seen in the 75 and older age groups: between 1996 and 2006, the propensity of people aged 75 to 79 to maintain owner-occupier households increased from 44.1 to 47.0 percent. In the 80 to 84 age group, rates increased from 38.0 to 43.1 percent, and in the 85-plus age group from 25.4 to 31.5 percent. Projecting these trends to continue to 2022 (albeit at a slower rate than what was seen over the past decade) will result in slightly higher owner-occupier rates in all age groups, with noticeable increases in the older age groups, as the rate for the 80 to 84 age group reaches 45 percent, and that of the 85-plus group reaches 34 percent. Applying these rates to Canada’s projected population shows that we should anticipate a 16 percent increase in the number of owner-occupied households in Canada by 2022 -- 1.6 million more owner-occupied units than there are today. While included in the owner-occupancy total, it is of interest to briefly look at the owner-occupied apartment (condo) segment of the market, as it has received significant attention of late due to the rate of apartment starts in some Canadian markets. While owner-occupied apartments constitute a relatively small segment of the housing market today—accounting for only 9.3 percent of all owner-occupied units—it has been the most rapidly growing one. Between 1996 and 2006, the owned condo market expanded by 67 percent while owned ground oriented units grew by 21 percent. Looking forward this market segment would benefit greatly from the high growth expected for the 55-plus age groups over the next decade, as the highest maintainer rates for owned condos are found in these age groups. While maintainer rates for the under-55 age groups are generally in the 2.5 to 3.2 percent range rates for the 55-plus age group begin at 3.7 percent for 55 to 59 year olds, and increase steadily to reach 7.0 percent in the 80 to 84 age group, before falling back to 5.7 percent in the 85-plus age group. Further to this, maintainer rates for this type of accommodation increased substantially over the 1996 to 2006 period, most noticeably in the 25 to 44 age groups and in the 70-plus age groups. In the oldest age groups, the rates increased from 3.4 percent of the people maintaining a household in a condo in 1996, through to 4.8 percent in 2001 and to 5.7 percent by 2006. A continuation of trends for this structure type, and the overall trends towards owner-occupancy, would result in 2022 maintainer rates for condos in the four percent range for the 25 to 44 age group, increasing into the seven percent range for those aged 75 and older. 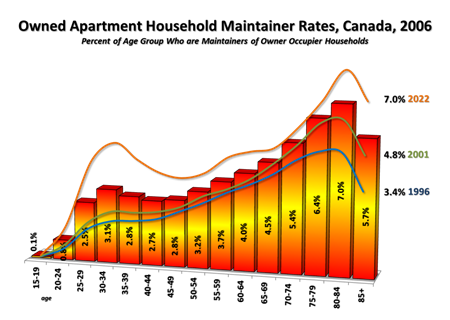 When the projected maintainer rate pattern for owner-occupied apartments is matched to the projected age composition of the Canadian population over the next decade, the result is a 28 percent increase in the number of owner-occupied apartments in Canada by 2022 (or 282,700 additional units). While this is a significant percentage increase, particularly when the total stock of owner-occupied households is projected to increase by only 16 percent, the absolute increases place this growth in perspective: the 282,700-unit increase in owner-occupied apartments represents only 18 percent of the projected 1,579,200-unit growth in all owner-occupier dwellings. The non-apartment ground oriented segment of the ownership market, which is overwhelmingly made up of single detached homes (but also includes duplexes and row houses), is projected to increase by 1,296,900 households, 15 percent growth over its 2012 base. While historically most retail residential mortgage lenders and brokers have had a focus on the owner-occupancy segment of the housing market (as most of their clients have been owner-occupiers), there is an increasing interest in the residential rental market. The reason for this broadening of focus is that an increasing number of individual borrowers are, in addition to financing their own home, using mortgage debt to finance the ownership of income-producing real estate as part of their household investment portfolio. 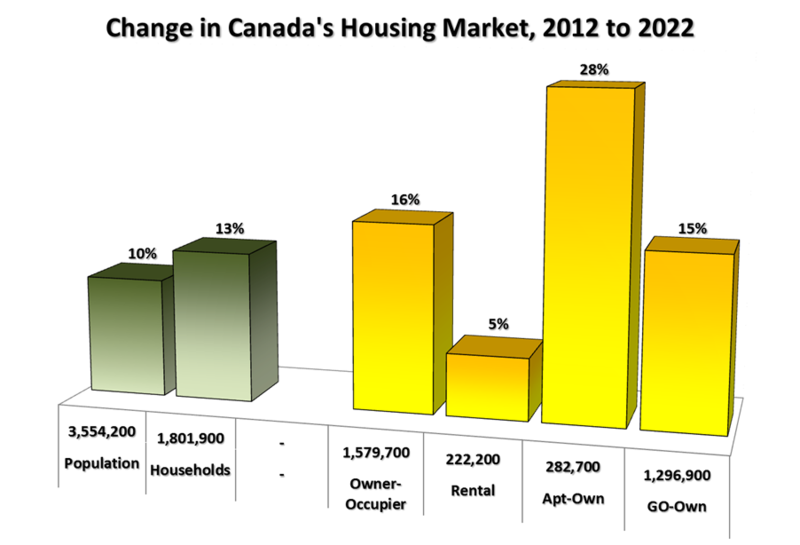 While not negative, demographics will not be as favourable for residential rental as it will be for owner-occupancy. The reason for this is that the life cycle of rental housing occupancy is not as concentrated in the rapidly growing older age groups. Moreover, in the face of increasing owner occupancy, rental propensities have been declining, particularly in the age groups that traditionally characterized the rental housing market. The highest tenant household maintainer rates, in the 20 to 23 percent range, are found in the young adult and senior age groups, with the rates in the intervening ages being relatively low (in the range of 13 to 17 percent). This pattern explains, in part, the relative softness of the rental market over the past couple of decades, as it is over this period that the baby boom generation has aged out of the younger, relatively high rental maintainer, age groups and into higher owner-occupancy stages. While the leading edge of the boom turning 65 in 2011 marks the transition to where rental maintainer rates begin to increase, the leading edge of the boom will not reach the stage where rates rival those of the younger age groups for many years. From an investment perspective, however, it is not the life cycle patterns of the boomers that are of interest per se, but the overall scale of growth in the rental market to support investment opportunities. The pattern of change in rental maintainer rates is, to a large extent, the mirror image of those for ownership, with the rates of rental maintainers declining in all age groups during the 1996 to 2006 period. For example, in the 80 to 84 age group, the rental household maintainer rate declined from one quarter of all people in the age group maintaining a household in rental accommodation in 1996 to 22.5 percent in 2001 and to 20.6 percent by 2006. Projecting this pattern of change in rental maintainer rates to 2022 results in a continuation of the decline in age specific rental household maintainer rates, most noticeably in the young adult and older senior age groups. When combined with the projection of population change, the pattern of demand for rental housing is also one of growth; albeit slow growth relative to the ownership side of the market. The total number of occupied rental units in Canada is projected to increase by five percent over the coming decade, or by 222,000 units. It is worth noting that many of these units will take the form of investor-owned condo apartments, a fertile area for mortgage financing. 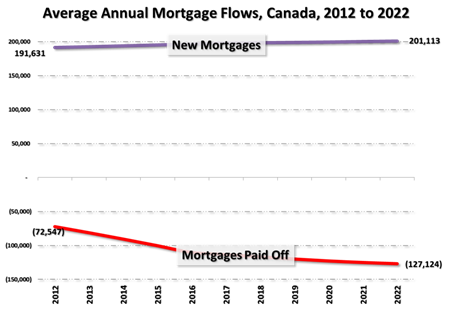 Having noted the drivers and directions of change expected for the Canadian housing market overall, the life cycle pattern of households holding mortgages does not, at first glance, hold as much promise for the mortgage industry, as there is a strong pattern of decline in the propensity of owner-occupiers to have a mortgage with age. 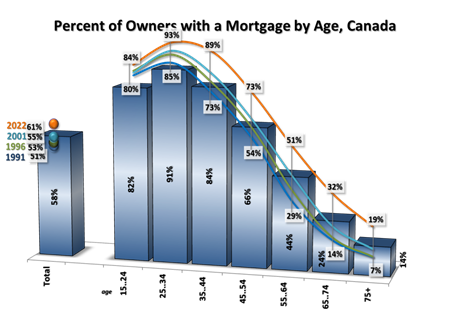 While 91 percent of owner-occupiers aged 25 to 34 had a mortgage in 2006 (the most recent Census data available), this declines to 84 percent in the 35 to 44 age group, 66 percent in the 45 to 54 age group, 44 percent in the 55 to 64 age group, 24 percent in the 65 to 74 age group, and further to only 14 percent of those aged 75-plus holding a mortgage. Following the growing propensity to be owner-occupiers, behavioral change is also altering this pattern with an increasing propensity to have a mortgage seen for all age groups. For example, between 1991 and 2006, the percentage of the 25 to 34 age group having a mortgage increased from 84.9 to 93.3 percent, from 29.0 percent of the 55 to 64 year olds to 51.2 percent, and more than doubled from seven percent of the 75-plus age group to 19.3 percent. The increasing propensity to borrow reflects a range of factors, including longer life expectancies, later household and family formation, later retirement, dual-wage earner families (and more significantly, dual-pension households), parents and grandparents helping kids to buy a home, the availability of reverse mortgages, changes to lending rules and mortgage insurance, and a general environment of declining lending rates since the late-1980s. Presuming that the historical pattern of increasing propensities to have mortgages will continue over the 2006 to 2022 period (again recognizing diminishing returns with much smaller future increases than have been seen historically), changing demographics would dictate an acceleration in the number of mortgages paid off each year, from the current 73,000 per year range towards the more than 125,000 by 2022. This, however, does not portend a demise of the mortgage industry. The sheer growth in the number of owner-occupier households in the 55 and older age groups (1.4 million more in ten years), combined with a continuation of modest increases in borrowing propensities for these older age groups, and the smaller contribution of growth in demand from the under-55 population (adding 222,000 owner-occupier households over the next decade), will largely offset the effects of changing demographics and the growing number of mortgage-free households. This means that we should expect a relatively stable number of new mortgage initiations to characterize the market, in the range of 190,000 to 200,000 each year, over the next decade. Building on the stability expected in new mortgage initiations, the renewal market will bring growth to the mortgage industry. While there is little historical or comprehensive data on the pattern of contract terms in residential mortgage finance, what little data do exist (including information provided by CAAMP in its mortgage market reviews), indicates that roughly 40 percent of loans have terms of less than five years, 45 percent have terms of exactly five years, and the remaining 15 percent have terms that are longer than five years. Applying this pattern of renewals to the stock of new mortgages each year results in an estimate of the annual number of renewals, which is projected to increase from the current range of 1.5 million mortgage renewals per year towards 1.8 million by 2022. Of course, any sudden, significant, or unanticipated changes in mortgage interest rates (or other lending parameters) would undoubtedly alter this outlook in the short-term, as they would affect household behaviour with respect to short-term household formation. Having stated this, given current national and international economic conditions, rapid and unexpected changes are both unexpected and unlikely. When interest rates do begin to increase, they will be modest and gradual, and consumers will know well in advance that the increases are coming, thereby allowing us to avoid a negative interest rate shock to the broader economy and, by extension, the housing and mortgage industry. Based on these data and projections, long-run trends look positive, pointing towards continued growth in Canada’s housing sector that will be fueled by a growing and changing population. The outlook for the mortgage industry would be the same, characterized by a growing—but changing—consumer base.